THE MEMBERS OF the Irish Nurses and Midwives Organisation (INMO) are to discuss an emergency motion on exploring alternatives to Croke Park 2. 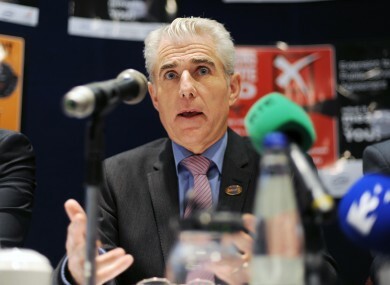 The motion calls on the conference to note “the continuing threat, from government, to cut the pay of nurses, midwives and other public servants, for a third time, and to worsen other longstanding terms and conditions of employment” and acknowledge the rejection of the Croke Park Agreement by the INMO and other unions. It mandates the organisation to continue to explore with the LRC alternatives to the rejected Croke Park 2 proposals. which may be agreed with other public service unions, as required, in pursuance of the maintenance of the existing income and terms and conditions of employment of members. The emergency motion will be discussed today during the INMO’s annual conference, which is taking place in Letterkenny. Minister for Health Dr James Reilly will address the conference tomorrow. The INMO president will speak to the gathered union members at 1pm today. Updated figures from the INMO’s trolley and ward watch shows an overall increase of 103 per cent between 2007 and 2013. It shows an increase from 3,800 people on trollies to 4,819 between 2007 and 2013 in the Eastern area, and from 7,067 to 11,430 overall in Ireland over the same period. Email “INMO to debate emergency motion on industrial action ”. Feedback on “INMO to debate emergency motion on industrial action ”.